I’m not going to go into the plot for My Brother Rabbit in all that much detail. Only that it revolves around a brother telling a story to his sick younger sister: a tale about a rabbit who carries his sick flower friend to the ends of the earth to get her healed. In fact, I’m not gonna talk about this game in any great length at all. Cause this is a game that needs to be played and experienced to be understood. 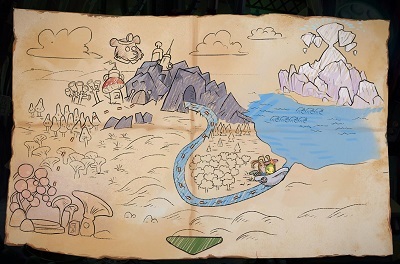 The entire game, outside of the main menu, some simple tutorial messages and credits, is entirely textless. There is no dialog if you don’t count the symbols and pictures that appear in speech bubbles or thought balloons. There are no documents to read to deepen the lore and there are no conveniently written instructions on how to proceed. Everything is visual and the visuals are fantastic. The gameplay, at its core, is essentially a HOPA as you’re typically tasked with finding a number of items in order for you to progress. But unlike a HOPA, there are no lists or silhouettes or anything like that. Each scene instead is just filled with items that you inevitably need to pick up. Sometimes they’re just lying about and other times you have to solve little environment puzzles. The scenes are also filled with just adorable things in general. 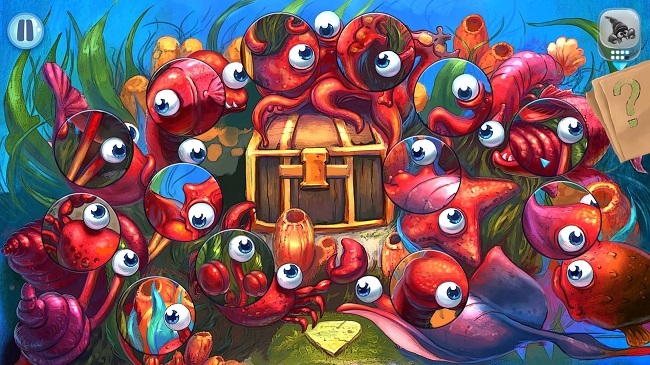 But as you find the items, you go back to where you needed them and typically play a little minigame or a puzzle. Now, if you take it only as such, the game isn’t particularly unique. 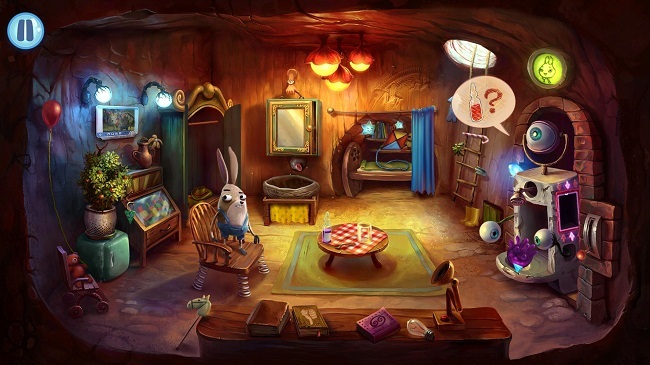 That’s the core cycle of most adventure games, including HOPA, but what sets My Brother Rabbit apart from that is the almost dream-like quality to it. It’s endlessly imaginative in its setting and the chacters you come across. And yet, never once did I feel particularly lost. 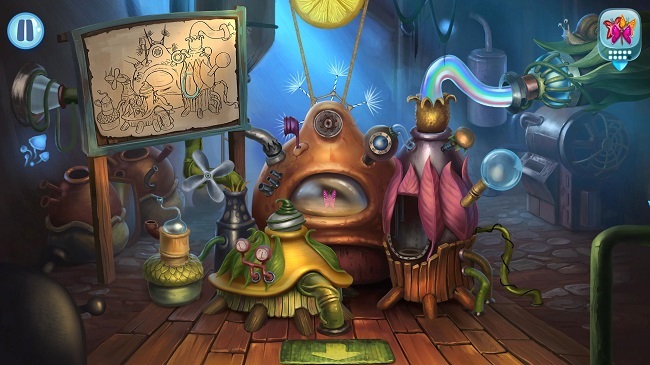 One issue with adventure games that are this fantasyesque is that solutions tend to get weird. But not here, not with My Brother Rabbit. Now I played this game a long, long time ago, at least the beta at the time though it was under a different name. And it had a different, far darker story which I think it was a mistake to soften but that’s me. And for the record, I cannot for the life of me remember what it was called back then. What I particularly liked in the game were the “mega puzzles”, essentially a giant fragmented object, most often a machine, that you had to put back together. That in itself is not strange or particularly unique but in the beginning, when you enter such a puzzle, you do it in silence. But as you add pieces to the machine, sounds start to play. At first it’s very simple little sounds but as you complete the machine, it becomes a tune that I couldn’t help but to get swept up in. It added a layer of “I wonder what sound this part will make…” and then you heard it and you were like “Aww, that’s nice.” Again, on a basic level, not wholly unique but the added musical touch made it very memorable. I might replay the game for that reason alone. And that’s essentially all I’m going to say about the game. It clocks in between 2 and 4 hours, depending on how good you are at puzzles and finding objects. And, of course, how much time you take to really enjoy the game. It’s filled to the brim with imagination and creativity, taking something on the surface pretty standard and turning it into something quite unique. Luckily, if you’re interested aftere reading this, the game is essentially available everywhere right now: on consoles, PC, Mac, even Linux already has a version. And it’s not expensive either so there really isn’t a reason not to get it!